(Nanowerk News) Scientists of the University of Freiburg and the University of Frankfurt have elucidated the architecture of the largest protein complex of the cellular respiratory chain. They discovered an unknown mechanism of energy conversion in this molecular complex. The mechanism is required to utilize the energy contained in food. After ten years of research work, the x-ray crystallographic analysis of the huge and most complicated protein complex of the mitochondrial respiratory chain was successful. The complex contains more than 40 different proteins, marks the entry to cellular respiration and is thus also called mitochondrial complex I. The results are published in the current online-edition of the journal Science ("Functional Modules and Structural Basis of Conformational Coupling in Mitochondrial Complex I"). The structural model of mitochondrial complex I provides new insights in energy conversion at nanoscale. 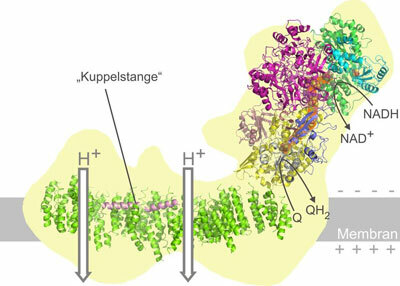 A molecular coupling device links pump modules in the membrane arm of the huge enzyme complex. A detailed understanding of the function of complex I is of special medical interest. Dysfunction of the complex is implicated in several neurodegenerative diseases such as Parkinson´s disease or Alzheimer´s disease, and also with the physiological processes of biological aging, in general. The work of Prof. Carola Hunte of the Freiburg Institute for Biochemistry and Molecular Biology and the Freiburg excellence centre BIOSS (Centre for Biological Signalling Studies) in cooperation with Prof. Ulrich Brandt, Professor for Molecular Bioenergetics and member of the excellence centre "Macromolecular Complexes" and Dr. Volker Zickermann of his research group is a major step forward to this understanding. The energy metabolism takes place in the so-called powerhouses of the cell, the mitochondria. They transduce the energy taken up as food into adenosine triphosphate, in short ATP, which is the universal energy currency of life. A chain of five complicated molecular machines in the mitochondrial membrane are responsible for the energy conversion. The production of ATP in mitochondria requires so many steps, as it is in principal a Knallgasreaction. In a laboratory experiment, hydrogen and oxygen gas would react in an explosion and the energy contained would be released as heat. In biological oxidation, the energy will be released by the membrane bound protein complexes of the respiratory chain in a controlled manner in small packages. Comparable to a fuel cell, this process generates an electrical membrane potential, which is the driving force of ATP synthesis. The total surface of all mitochondrial membranes in a human body covers about 14.000 square meter. This accounts for a daily production of about 65 kg of ATP. The now presented structural model provides important and unexpected insights for the function of complex I. A special type of "transmission element", which is not known from any other protein, appears to be responsible for the energy transduction within the complex by mechanical nanoscale coupling. Transferred to the technical world, this could be described as a power transmission by a coupling rod, which connects for instance the wheels of a steam train. This new nano-mechanical principle will now be analysed by additional functional studies and a refined structural analysis.